Pre-monsoon works carried out in Panjim has yet again proved to be a major disaster after heavy rains in the last couple of days resulted in severe water logging. As normal life was affected with residents suffering and water logging leading to massive traffic jam for several hours, question has once again been asked as to whether the authorities are really serious about solving this problem. Many parts of the city were inundated but one of the worst affected areas was the commercial hub of 18 June Road wherein people were seen wading through knee-deep water and some shops were flooded. One of these affected establishments was a local shop retailing handicrafts that reported a loss of around Rs one lakh. “As the road started getting flooded, so was my shop. My staff and myself managed to save some articles which were placed on the ground. However, continuous rains affected my shop’s wall, floor, furniture and some handicrafts items. Total loss of the property estimated so far is around Rs one lakh,” proprietor of the store Ajay Ponjekar told Herald displaying the ‘spoilt’ articles to this reporter. He lamented the annual pre-monsoon work which had no effect and which had resulted in losses for shops located along the low-lying areas. A renowned garments store owner narrated the same experience claiming that pre-monsoon works were an eye-wash to loot the tax payers’ money. “The cleaning of drainages, digging of roads and filling of potholes prior to the monsoon season is just an eye-wash. These works instead result in further chaos of traffic and eventually, during the rains, it worsens. The government and the Corporation are instead misusing our tax payers’ money,” he claimed. The affected businessman, known in the high-profile circuit in the State, however refused to be named saying he would be harassed by Corporation officials. The congested road stretch also saw huge traffic jam for many hours, a situation that inconvenienced other commuters too. “It is really frustrating that the 18 June road is already congested but during the rains, it gets worse. The roads get hidden in the muddy pool of water and who will take the risk of proceeding further when they can’t judge where the road is and where the potholes are?” said another angry Panjim resident Dinesh Sehgal, a motorist. These are just a few examples of problems faced by the citizens. The last few days have seen a series of complaints from the locals as well as office-goers and the business community. 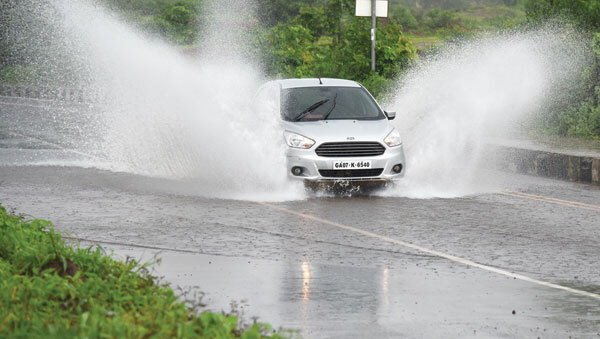 Even as the government is questioned over rain-related problems in Goa, BJP State President Vinay Tendulkar said such problems ‘happens during the rains. “It happens during heavy rains. Some damages to the roads, etc will happen,” Tendulkar told a section of media on the sidelines of a party function in the capital on Monday. Herald contacted CCP Mayor Vithal Chopdekar who claimed that pre monsoon work on the 18 June road was carried out first by then Mayor Surendra Furtado. “The work along this stretch was taken up first by Furtado, before I took over as Mayor. The water logging in the city was perhaps because of the high tide,” he justified. CEO and MD of Imagine Panjim Smart City Development Limited Swayandipta Pal Chaudhuri has suggested that all basic amenities need to be in place for a smart city. “There is a plan for Smart City which has gone in as a part of Smart City proposal which has been approved by CCP, State government and Union Government. For a city to be smart, clearly all basic amenities needs to be in place but Imagine Panjim cannot be blamed for such problems in the city,” he said.